This site has all of the best exercises for stomach and core strengthening. There are many different tools that you can use to strengthen your stomach. 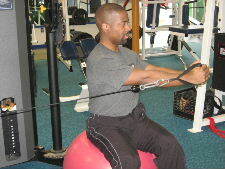 You can use cable exercises to add resistance and rotation to your core workout, and you can use the stability ball to increase balance and coordination during stomach exercises. 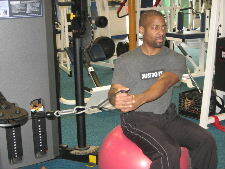 Starting Position: Adjust a cable machine so that the resistance is between waist and shoulder level when you are seated on a ball. If the cable machine in the gym is not adjustable, attach a handle to the bottom part of the machine. Use a stability ball that allows you to sit with your hips and knees in a stable position. Form: While keeping a good sitting posture, exhale and rotate your arms and torso away from the resistance on the cable machine. Hold for a brief second and then slowly return to the starting position. Personal Trainer Tips: With this exercise, it is important to use your arms only as an anchor to transfer the weight to your core muscles. Focus on turning from your waist and not your arms. Use a weight that allows you to keep good form, and move in a slow and controlled manner. Perform10-15 reps on each side. If you don't have access to a stability ball or a cable machine, don't worry. 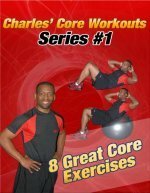 This site has many of the best exercises for stomach and core strengthening that don't require equipment. Remember to listen to your body and have fun working out.